Enjoy a creek-side cabin and sugar white sandbars on Red Creek! Miss Scarlet Is 1 of 2 cabins at Elevate Red Creek. Waterfront cabins overlooking Red Creek! Rest, Relax and Rejuvenate….you’re at the creek! Only 30 minutes from shopping and dining in D'Iberville/Biloxi, but it feels like a million miles from traffic and worries! 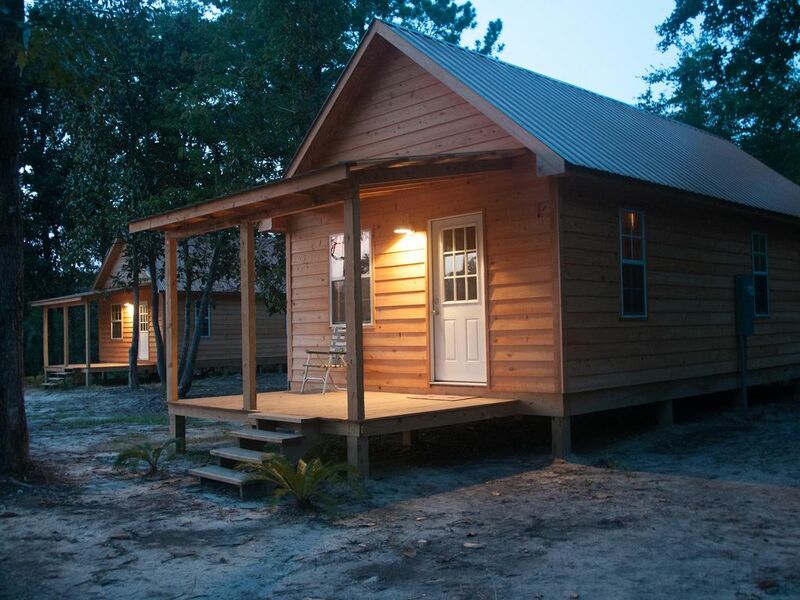 Come explore all Red Creek and South Mississippi have to offer in absolute comfort. Miss Scarlet, built on one of the highest bluffs on Red Creek, allows complete solitude as you watch the creek meander along its journey to the Gulf of Mexico. Red Creek, one of the most beautiful tributaries in the Pascagoula River Basin, is a pristine free-flowing black water creek, and you can enjoy it from your cabin or from one of the beautiful sandbars that border the property, shallow enough for the little ones to swim. We look forward to seeing you and sharing raw beauty of Red Creek with you and your family! We have a strict non-smoking and no-pet policy at the property and thank you for your understanding and consideration. Located close to Vancleave, Lucedale and Wiggins Mississippi. This is a REAL get-away. Unplug, unwind, relax and rejuvenate. Shopping and dining are 30 minutes away in D'Iberville or Ocean Springs. From the back porch of the cabin, the creek provides a beautiful backdrop. From the sandbar that borders the creek, it's even more beautiful. Cabins are located on the bank of Red Creek. Back porch overlooks the creek. WiFi is not located in cabin - located near the bath houses on property. A great little cabin. My (5 yr) daughter and I had a wonderful Labor Day weekend. The river has an amazing sandy bottom we kayaked up river and floated back. Spent hours just hanging out on the sand bar, playing in the sand having picnics. It was a very nice quiet place . It was a very nice and quiet place, couldn't enjoy the water cause it rained so much Thursday the creek was way up all weekend. Great place for a couple to go to , just get away. I took two 16 year old girls and we left Friday and spent the day on the Gulfcoast we were about 30 min from Deiberville ,and 25 min from Wiggins . They didn't like it that the cell service was poor , but they survived LOL . T.J. was very helpful with directions and anything we needed. Had a great time!! Nice clean cabin. Great place to get away from it all. Had a sandbar on the creek all to ourselves. Great weekend getaway. Loved the layout and location of this property. We loved our stay at RCA. It was very peaceful and quiet. The owners TJ and Dusty are very nice and friendly people, were also very attentive to our needs. We came for a quiet get-away and got just that. We had hoped to get out on the creek but river stage was too high during our stay(maybe next time). And we will definitely do the zip line courses next time as well Thanks for everything guys, looking forward to our next visit. Rates are subject to change until reservation is confirmed. There is a maximum occupancy of 4 adults in each cabin. $40 Cleaning Fee is for usual and customary cleaning to make the cabin ready for the next guest. A property inspection will be conducted at time of check-out/cleaning. This includes washing all dishes, sweeping floors/porches, putting furniture back in its place and removing any garbage from areas around the cabin. Any excess cleaning required, evidence of smoking in or around the cabin, evidence of pets in or around the cabin, property damage or theft of cabin and/or property contents will result in additional fees associated with repair, replacement or cleaning needed to ensure cabin may be rented to the next guest.